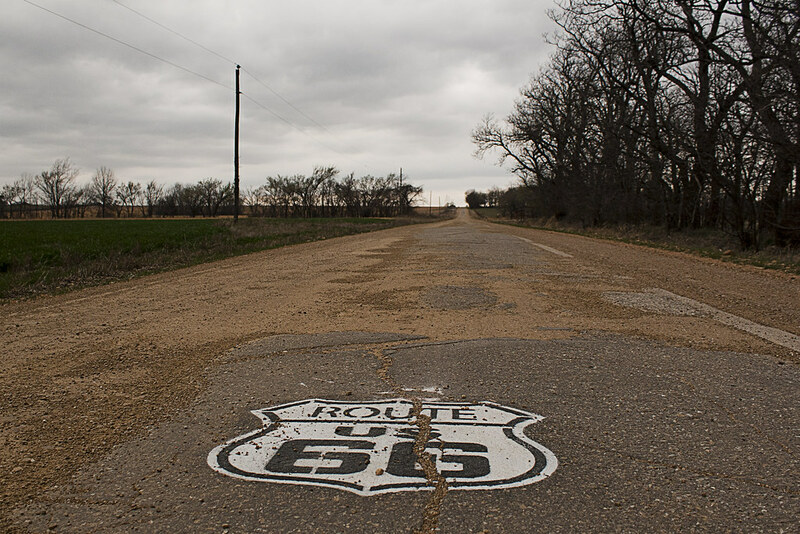 Eighty percent of the decommissioned Route 66 still exists in some form or another, but you won’t find much of it in a road atlas. Most of the miles are paved over and going by a different name now. Some became country roads where the original Route 66 pavement still peaks through gravel and dirt. Some of the miles are now Farm-to-Market roads and a good chunk is now a service road for Interstate 40. Although it's true that the Interstate is faster, in better condition, and doesn’t take you into every town between you and your destination, if I have to get on the Interstate for a few miles, I’m anxious to get back to the old Route 66. The car was quiet other than the hum of the rough pavement under the tires. Thumper was reading a book. I was daydreaming while looking out at the line of traffic on Interstate 40. So many cars, yet I was the only one on Route 66 as far as I could see. With all the advantages of an Interstate, I tried to think of why I prefer the old road. Why, after hundreds of miles, have I almost developed an emotional attachment to it? I tried to come up with a comparison to explain the difference and thought of old weather-beaten barns. New barns have their advantages too, but they never make me want to pull my car off to the side of the road, grab my camera, and walk across a muddy field to take pictures of it. This reminded me of when I went to visit the girls in Kentucky before this trip began. While I sped down Route 66 and stared out at the long stretch of bumpy two-lane highway, I thought about Thumper giving me a tour of their farm. We went into a barn that had sunlight shining through the cracks between the siding. We climbed onto a stack of hay bales and sat while she told stories of growing up on the farm. Like the old barn, the old highway has a history. I think that’s why I prefer it. The old road has stories. It's not just for getting from point A to point B. Traveling on it adds to your life's experiences. The way it resides in our fond memories, it almost seems like a living thing. For lack of a better word, Route 66 has a soul. Suddenly, I noticed the road change up ahead. I was speeding along at sixty miles per hour then slammed on my breaks. My tires skidded a few yards on the chipped and crumbling highway. Thumper dropped her book to her lap and drew back into her seat. 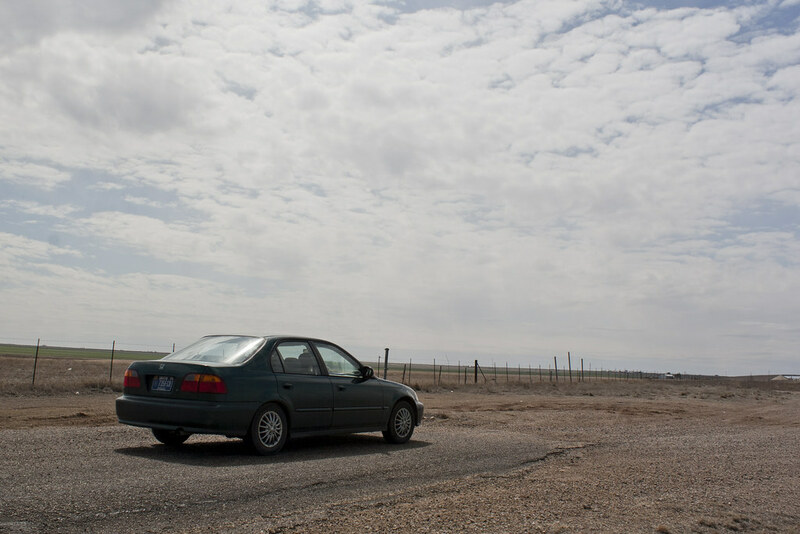 The road’s pavement came to an abrupt end and turned to gravel, grass, and bumpy tire tracks sunken into the soil from previous Sixty-sixers sliding to a stop and U-turning. We laughed at the situation while adrenaline increased our heart rate and turned our legs to jelly. We tried to see if we could continue in the Honda, but they weren’t exactly built for off-road. 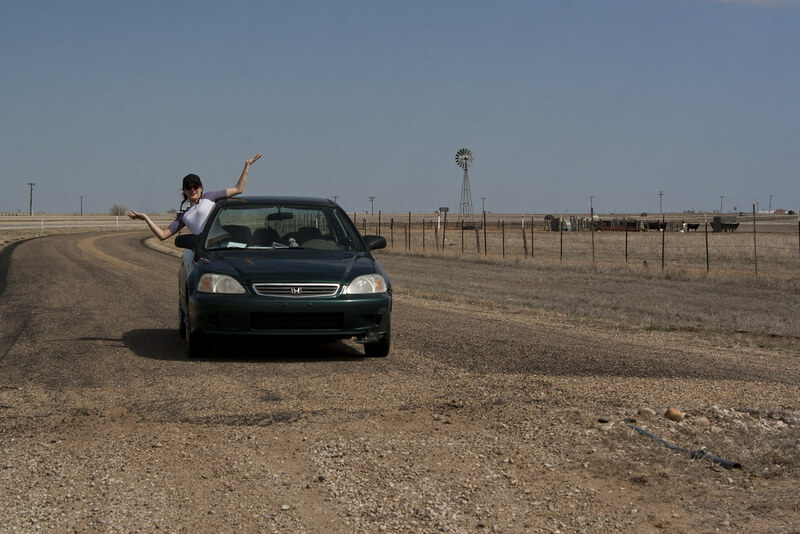 I turned the car around and we had another Route 66 story to add to our list. I continued my drive to Amarillo, TX on Interstate 40, but at the next chance I got, I pulled back on the old beaten down road ready to see what else it might throw our way.